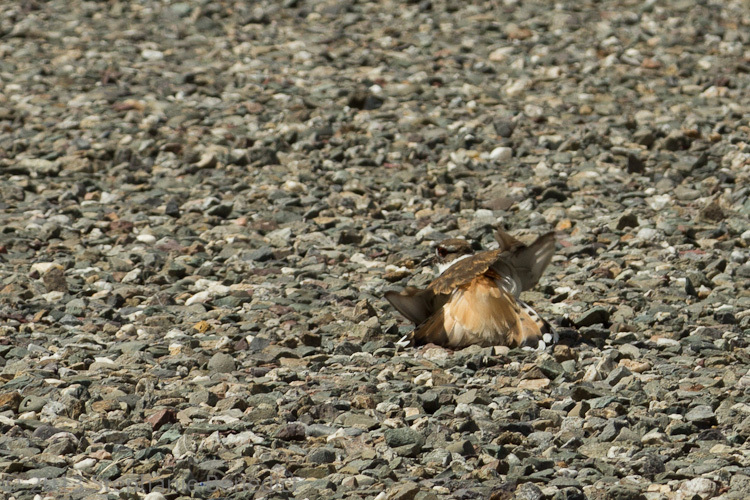 The killdeer pair figured they’d found the perfect nesting site. 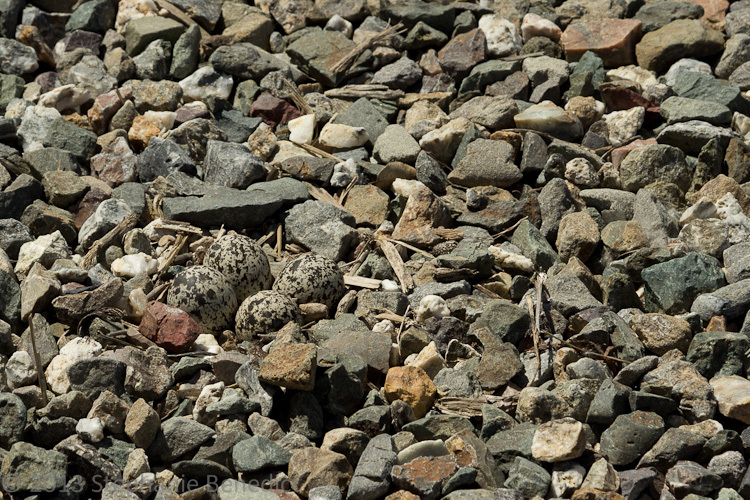 It was in the middle of a wide open gravel patch at the Sacramento National Wildlife Refuge, with lots of gray and white rocks to hide their speckled eggs in. They could see for some distance in every direction, so they could spot any raccoons or snakes coming, and could trick the predators away from the nest. They laid four eggs, and were carefully tending them to keep them warm at night and not too hot during the day. What they hadn’t counted on was a bunch of humans and their vehicles taking over their nest area. 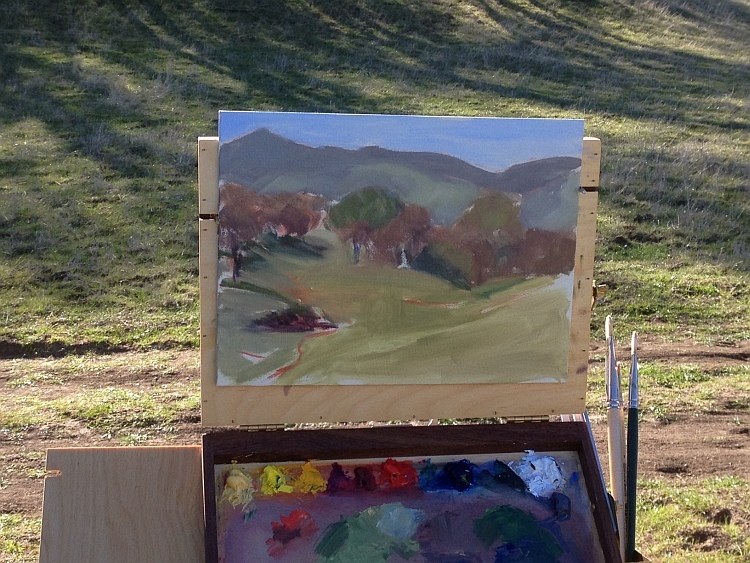 The humans were a group of about a half dozen painters, myself included, who had come to paint spring wildflowers. This was the second of two paint-outs the U. S. Fish and Wildlife Service had hosted at their refuges in the Sacramento valley. The Sacramento National Wildlife Refuge, April 2013. Painters scout out paintings. Amy, a volunteer for the refuge, escorted us to go to one of the areas normally closed to the public. The refuge staff had generously set up awnings for shade, for the area was wide open. Behind us was a ditch and some willows, but the wildflowers were in a huge open area to our west. We parked in a gravel lot normally used by hunters in the fall—otherwise, few people ever came out here. Most of us just parked our cars and started scouting around for something to paint. One woman moved her SUV to a better location. Later, someone from the refuge came in a pickup, parked where the SUV had originally stopped, then backed out and drove off. What we didn’t know was that both of those vehicles literally drove right over an active killdeer nest. Luckily, neither of the trucks hit the eggs. Why Is She Acting So Strangely? 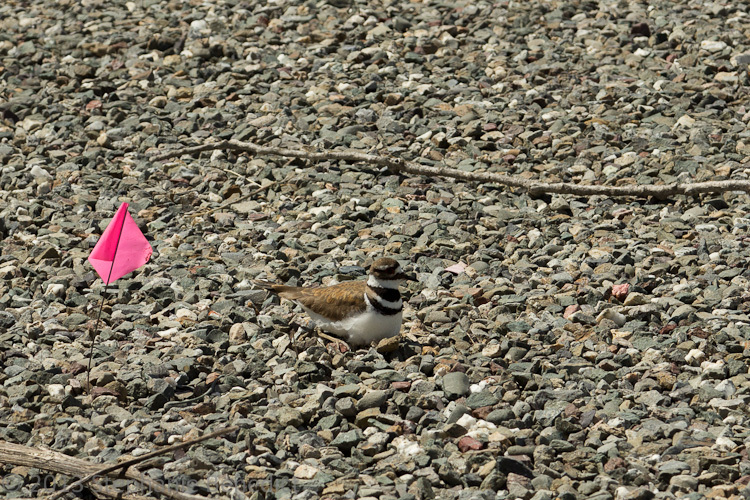 We humans didn’t even cotton on to the fact there was a nest there until later, when Amy realized that this killdeer would start acting upset and go into her broken wing routine every time we walked near our vehicles. Killdeer distract predators from their nests by pretending to be injured, like this one is doing. So I watched her for a few minutes, when she circled back to a spot behind where those two trucks had briefly parked. There, she halted, and sat down. That must be her nest. Four killdeer eggs are in the lower left of the photo. And my painting? Well, it’s a good start. There’s information there I can use to make another one, with a different composition. Mostly, I’m very glad that our visit didn’t end in tragedy for that killdeer pair. It’s bad enough when insects get into the paint. Have you seen a killdeer nest? Mama killdeer safely back on her nest. The flags and sticks are there to warn other humans away. 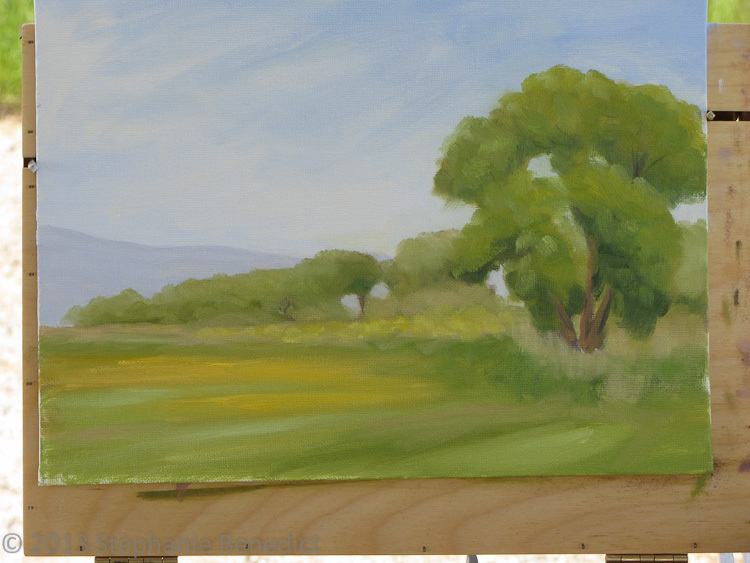 Now that they’re dry and photographed (and signed), here are the two paintings I did at the Colusa National Wildlife Refuge two weeks ago. 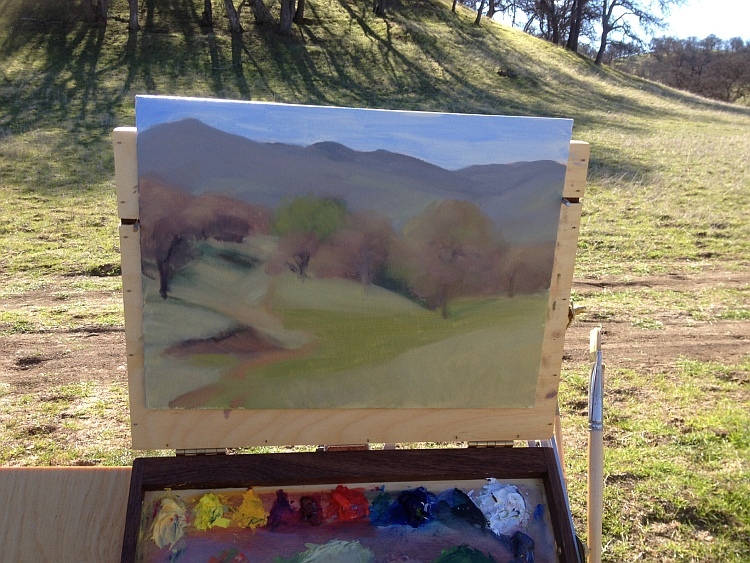 The first one, Snow on Snow Mountain, was done in late morning, with the sun over my left shoulder. 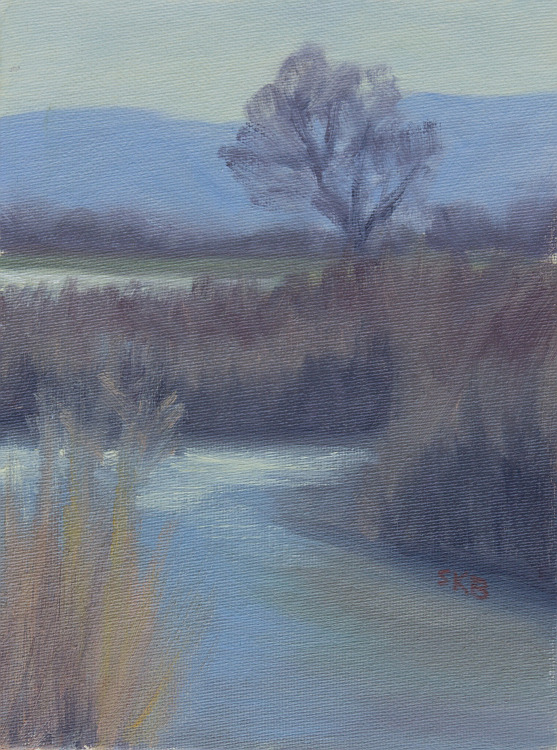 The marsh in the morning was clear and cold, with a north wind blowing. To the west, in the Coast Range, Snow Mountain had a fresh dusting of snow. Snow on Snow Mountain ©2013 Stephanie Benedict. 8″ x 6″ oil on board. 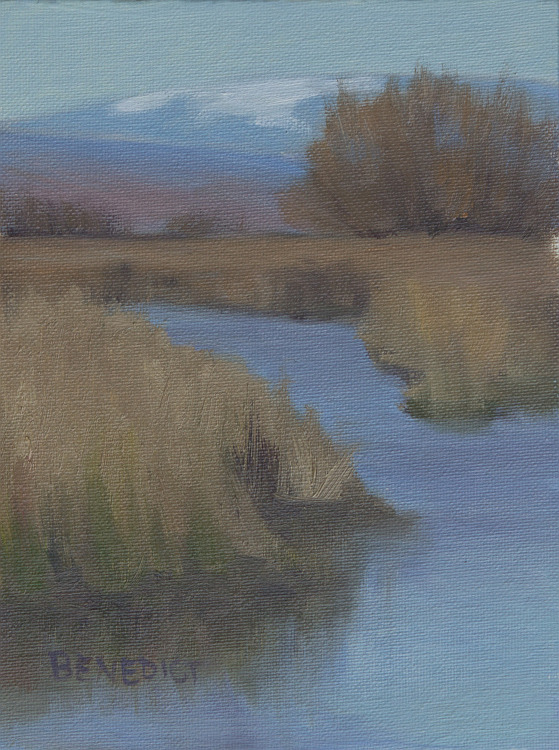 The second, Light on the Water, was done mid- to late-afternoon. The light that day just kept getting better and better—except that, as the sun moved west, it reflected more and more off the water. Eventually, I couldn’t look at the scene without getting blinded by the glare. Surely a small price to pay for getting to spend the afternoon listening to ross’ geese, greater white-fronted geese, several kinds of ducks. The afternoon sun reflected gold on the marsh waters. Light on the Water, ©2013 Stephanie Benedict. OIl on board, 8″ x 6″. 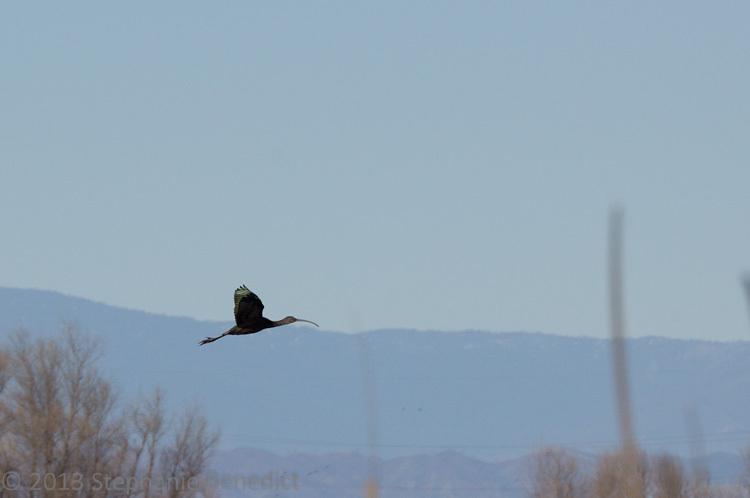 I even got a new bird for my life list: white-faced ibis. How cool is that? These guys are fairly common in the Central Valley in the winter–I’d just never seen one before.